Errol: First off, I am SUPER APPRECIATIVE of your support. 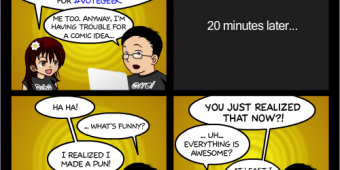 I was hesitant of putting this comic up because it sounds like I am taking it all for granted. I’m not. I am surprised by the dedication I am hearing from a lot of you when it comes to voting and you are awesome. And the further we get in this contest, the better chance of us finding more and more of our audience! In fact, just with what we have now, I have introduced more people to the wonderful world of geek music! And not people that needed to be convinced, but those that would actually be interested! That’s awesome! However, it is tiring. And although it’d be amazing if we did get into the next round, that would mean even more work because I can’t seem to help myself when it comes to this. And I haven’t done my taxes yet either. Oh Well! We’ll find out this afternoon! 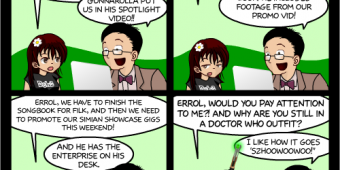 Errol: PICTURES! WE WANT PICTURES! Well, I want your pictures. Debs doesn’t even know what I’m doing with them. Actually, I don’t even know what I’m doing. Probably will make a collage. Just like the comic says. 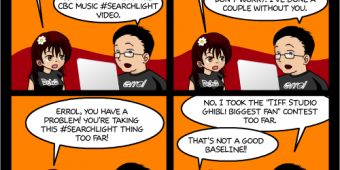 And yes, I made another parody video for #Searchlight this time based on Modern Major General. Errol: Wow. It’s been how many days of this contest? And if CBC isn’t wishing I’d shut about this, the ‘serious’ musicians probably are. Hah! Anyway, there have been some great articles out there covering this. Check them out! 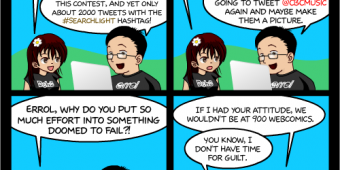 Nerd Mafia did their own spotlight on us! Errol: Our NINE HUNDREDTH COMIC! I have no idea what I’m going to do at a thousand. I know I keep saying we’re not going to win, and believe it or not, that’s not a defeatist attitude. I’m not saying it with secret hopes of winning either. But I can’t help myself, I want to throw 200% into my projects. Some people go into projects knowing they will fail, and thus set themselves up to fail. I am not going to do that. I will go in, lasers blazing, and I will go out in a Death Star explosion of glory. I’m not afraid of failure. Does that mean I don’t expect you to vote? No! 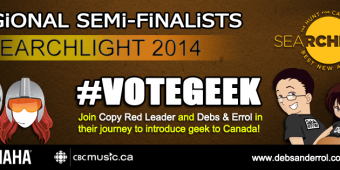 With every vote, there is a chance that the geek music genre gets noticed. With every vote, there is a chance that one of us will advance to the next round. 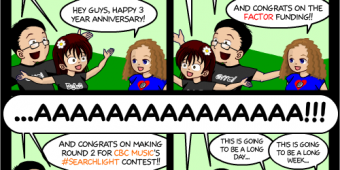 With every vote, CBC Music will find out that we have passionate fans! There are a lot of talented geek bands in Canada, and I want to find them all. I want to promote them. I am not giving up. I will continue voting, and I will continue pushing this. And I need you guys!